Hi Annie: Beleive it or not, one of my goals in life is to live on a remote island. I am very jealous!! The Caswell carpet quilt is on my to-do list! I used to do all of my applique using the needle-turn method, in fact, I taught needle-turn for many years. Once I switched to the starch and freezer paper method, I have not looked back! Give it a try! I have been following your blog since I linked to it from the CWB blog. Your work is exquisite. I also love to appliqué and have completed a Baltimore Album as well as the CWBQ. I can see that you use freezer paper. Do you use starch or glue? I am so inspired by your work. I have mostly used needle turn but recently discovered heat resistant plastic and starch. Thanks for following me! I use starch to press the seam allowance over the freezer paper template, and then Roxanne’s glue to keep everything in place until it is stitched. I used to use heat resistant plastic, but I find freezer paper much easier to use. I used to do needleturn also, but when I saw this starch method, I thought I would give it a try. I never do needleturn anymore! I have searched and searched but can’t find your actual techniques for applique. I know you starch but exactly how is it done? Your work is so beautiful!! I really enjoy your blog. Hi Linda: Thanks for following my blog! The starch method I use involves using a mini iron and starch and a stiletto. I iron the freezer paper template to the wrong side of the fabric and use a paint brush to wet the seam allowance with starch. Then I press the seam allowance over the template. I am going to show step by step the progress of the rose block I blogged about yesterday. I found the May 19th post as good as any tutorial. Thanks! where can I purchase your book on beginning applique. I think it has a video to go along with the book. I think you might have me mixed up with someone else! I don’t have a book. Maybe I will write one! Yes I did I had been looking at different sights and thought I was back on Mary Soreance page. Hi Kerry, love your blog. Is there a full picture of Annabelle somewhere? I like the idea of a big centre block. All those leaves for the border – love it! Not sure if I’m doing this correctly as have never blogged. Guild member told me of your website and I spent the afternoon watching your excellent tutorials. Was intrigued that you washed individual blocks before assembling the quilt and that you prewashed everything with Synthrapol before using. When doing a purchased block of the month that provides fabric they can be teeny pieces, would you pre treat these in the same way as yardage? Could you wash the dark pieces together and do the same for the light? Up to now I have not been a prewasher and have had some disastrous experiences with bleeding. Please where can we purchase your patterns as I would love the lpattern of daffs in your u tube video thanking you regards Jean. 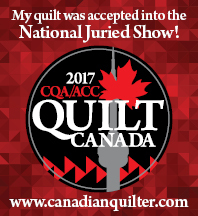 I am an applique addict as well… Nice to meet another! I use needleturn. I have never tried the starch and freezer paper method. How do you remove the freezer paper after you stitch it?